Makha Bucha Day (วันมาฆบูชา) is a Buddhist holiday, which takes place annually on the night of the full moon during the third lunar month of the year. “Makha” is the Pali word for the third Lunar month, while “bucha” means to honor or to venerate. Since Makha Bucha is based on the lunar calendar, the date varies from year to year. This year Makha Bucha day is on 19 February 2019. 1. There were 1,250 Sangha followers decided to come back to see Lord Buddha at Weluwan Wannaram without prior appointment after traveling around and teaching Buddhism. 2. All of them were “อรหันต์ Arhantas’, the Enlightened One, and all of them were ordained by the Buddha himself. 3. 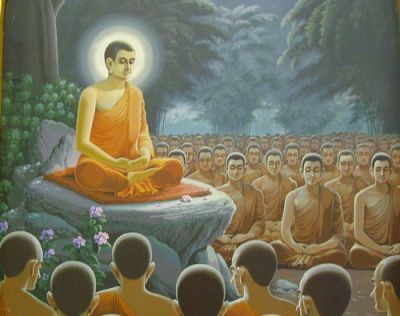 Because it was the first assembly of the large group of the Buddhist monk gathering therefore the Buddha gave those Arhantas the three principles of the Buddhism, called “The Ovadhapatimokha” which is considered the first constitution for all the laws of Buddhist monks from then until now. 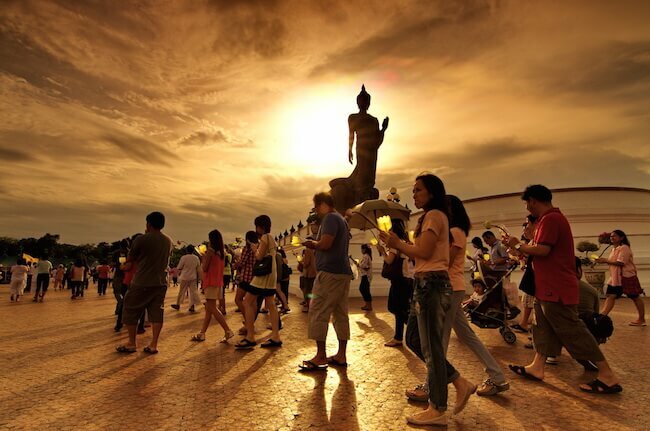 Thailand started celebrating Makha Bucha Day during the reign of King Rama IV, around 150 years ago. King Rama IV felt that Buddhist teachings were very important, recognising that Makha Bucha was one of the most remarkable events in Buddhist history. His Majesty therefore introduced the first celebration of Makha Bucha Day to his royal family members and courtiers. The celebration soon gained popularity among Siamese commoners. 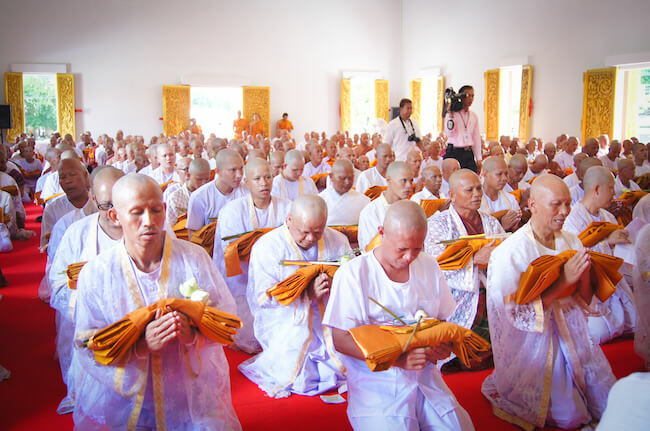 ‘ทำบุญ/ tam-bun/’: Making merit by going to temples for special observances, making merit, listening to Dhamma preaching, giving some donations and the other activities of the day include acts of merit such as freeing fish and birds . 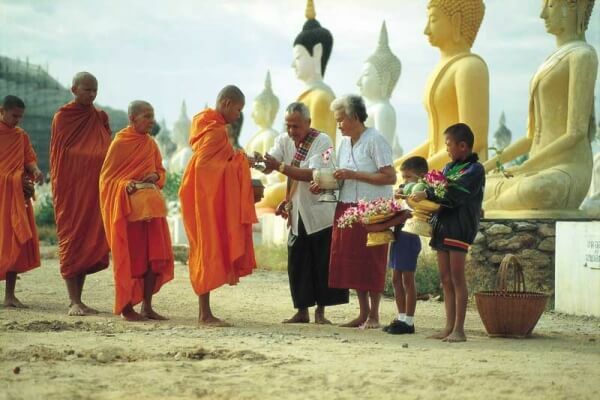 ‘ตักบาตร /dtàk bàat/’: Offering food to the monks and novices (in the alm bowl (บาตร /bàat/). ‘เวียนเทียน /wain tain/: Monks and other believers of the Buddhist philosophy hold candlelit processions with monks who also hold a sacred thread in a procession around the temple.Buddhists from across the cities throughout the country flock to temples to participate in these processions. Thai government announces this day a national holiday so people can participate in religious ritual and perform good merit for their good karma. Many temples, religious and mediation centres welcome both Buddhist Thais and foreigners who would like to enter into mediation sessions provided countrywide, which include Paknam Phasicharoen Temple in Bangkok. Alcohol is not served in observance of religious holidays in Thailand. On Makha Bucha Day, consumption of alcohol is not only considered a religious violation but also a civil offense. Bars, restaurants, supermarkets, department stores, retail and convenience stores and even some hotels are prohibited from selling or serving alcohol to customers and their guests. Violation of this alcohol ban may result to imprisonment of up to six months and a steep fine (10,000 Baht as of last decree). Although that doesn’t mean that all entertainment venues adhere strictly to the regulations. Some bars and clubs in Thailand may choose to close for Buddhist holidays, but those that do decide to remain open often resort to pouring beer into coffee mugs before handing it to the customer. I undertake the training rule to avoid sensual misconduct. Thank you for the information. I had difficulty finding a good explanation of the reason for the holiday on the internet. Yours was very comprehensive. The full moon here in Thailand was very beautiful from Bangkapi. Can you explain why in the evening we, along with big crowds of Thai people, walk round the temple 3 times? I understand what we are doing but what is significant about 3 circuits? The meaning of walking around 3 times is Triple Gem which in Thai is called “พระรัตนตรัย /prá-rát-dtà-ná-dtrai/”. It is a Pali word; “Rattana” means ‘gem’ and “Tri” means ‘three’. “Triple Gem” means the three holy gems which include Buddha Gem ( the Teachings spoken by the Buddha himself ), Dhamma gem (the Teachings of the Buddha) and sangha Gem(monks who are ordained in the Buddhist religion) . I have been a monk ,but i learnt some things from your post. Thank you, Mod, for your wonderful lessons. I am so impressed with the Thai people, their manners, their generosity, their reverence for things sacred, and their respect for Thai traditions. I recently had the pleasure of visiting Thailand and I was so impressed with the reverence the Thai people have for their Buddhist teachings and traditions. I think that this is reflected in the way they live, work, and treat others. All Thai should be proud of what they are, what they believe, and where they live. thank you kruu mod your lessons are always informative and helpful. This year Makha Bucha day is on 4 March 2015. Next year Makha Bucha day is on 22 February 2016. “fermented drink that causes heedlessness” I love it! Who needs it anyway? It’s bad for you and it wastes your money and makes you look stupid and ignorant. What I don’t get though is Buddhism teaches us the “right way of living”, to renounce the material possessions to become a holy man. But yet so many Thais claim to be Buddhist and drive big cars and live in luxury houses. How can this be? I think the misunderstanding of that tenet of Buddhism is that one does not need to relinquish all material possessions and comforts to move towards enlightenment or a good next incarnation. Remember the story of the Buddha going from a prince to starving himself along with all the other ascetics. Only when he found the balance which he would later call the middle path did he find enlightenment. I think that people can enjoy the comforts of life they don’t necessarily need to live poorly to find their paths. Would a foreigner wish a Thai person ‘a happy Makha Bucha’ or is this not done as it is expected of the person to observe it regardless? Sawatdee ka lain, we don’t usually give wishes to others on a Buddhist holiday. We do only on fun occasions. Thanks very much Mod. Thai culture so nice! Mod; Thank for sharing this Buddhist Culture to us. Tam Dai Dee Mahk, Krop Kun Mahk Na Krup.